Part of the money we need to raise to continue our vital work is made possible thanks to the generosity of people who remember us in their Wills. Every year, we need to raise £1million so that we can continue our vital work for the future of Israel. Your gift, whether small or large, will help us ensure we can use it for projects and activities at it’s discretion, to fund the most urgent needs of the organisation for years to come. Pay for speaker tours, we bring experts from Israel to speak in from of both friendly and hostile audience in a variety of settings, reaching 4,000 people annually around the UK. Help pay for students programme, informing and educating students on Israel, reaching 3,000 students in Schools, Campus and community centres. Support us in providing training and knowledge for over 500 activists in order for them to act on our behalf on social media and hostile events. 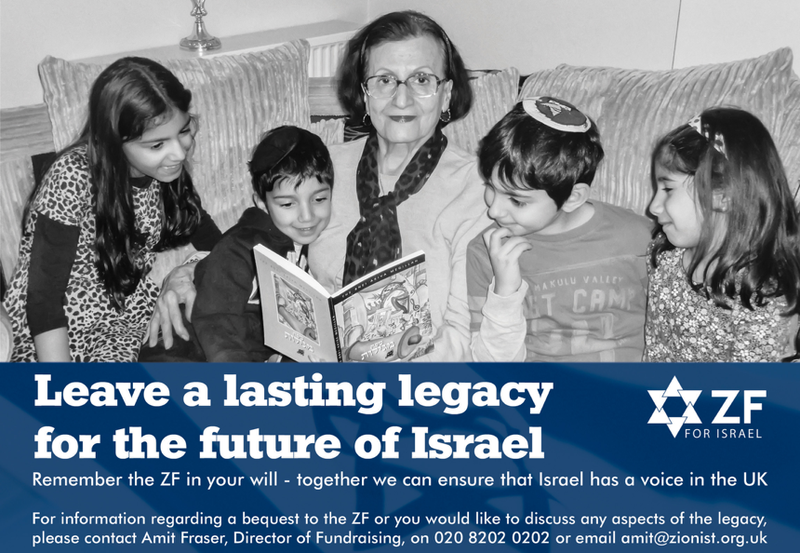 Please contact Amit Fraser on 020 8202 0202 or email: emma@zionist.org.uk more information about how we can support your legacy.